Refrigerator vs. Wine Cooler? What Do You Really Need? 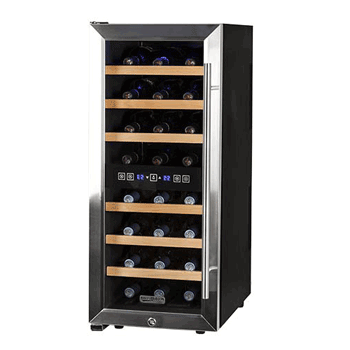 If your interior space is very limited and yet you still want to entertain the wine enthusiast in you, this Wine Enthusiast 6 Bottle Wine Cooler review will come in very handy. Our exploration of this compact, lightweight and very portable (and affordable) wine cooler will shed some light on a great choice for you, or to be purchased as a nice gift for a fellow wine-loving friend or loved-one. Read on if you are indeed short on space to house a wine cooler, or indeed if you are on the hunt for a portable wine cooler. As far as optimal wine storage, display and protection go, the design of this 6 bottle wine cooler is deeply-rooted in convenience. This isn’t only an effective entry-level capacity wine cooler but is also a design feature that will actually enhance any countertop area you decide to put in on. The reflective surface of the smoked glass door is a sight to behold, with the stainless-steel trimming and chrome shelves completing the elegant appearance of this eye-catching cooler. This cooler makes very good use of stainless steel as its lining material to achieve a very enviable sophisticated appearance. Weighing in at a comfortable 30 lbs, this wine cooler is quite portable, especially when you consider that it only takes up a volume of 16” (H) x 10.5” (W) x 19.6” (D). Because of the entry-level capacity of only 6 bottles, it only makes sense for this cooler to be thermoelectric-cooled. Thermoelectric cooling does make it very energy-efficient and relatively quiet though; it’s free of CFCs and subsequently has a very small environmental footprint. An LED-based interior light gives you effective visibility of your bottles (labels), while the internal temperature is easily observed and manageable through the digital touch-screen control/display unit. This very affordable cooler comes with a one-year limited warranty and is not meant for under-counter or built-in application. It’s a countertop counter through-and-through and is very portable too. 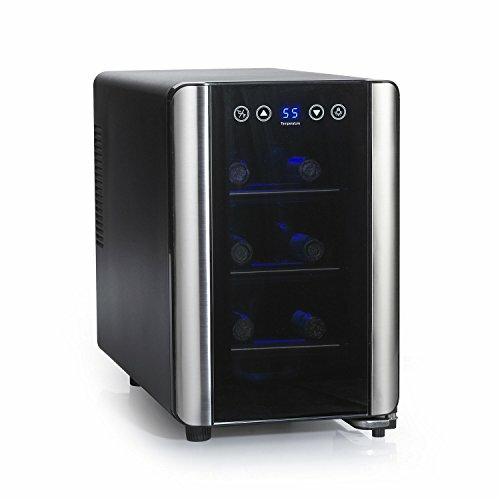 This compact and portable wine cooler comes with a hassle-free setup and installation process, with a lot of little functionality features just waiting to give you a wine lover’s surprise with each day that goes by. 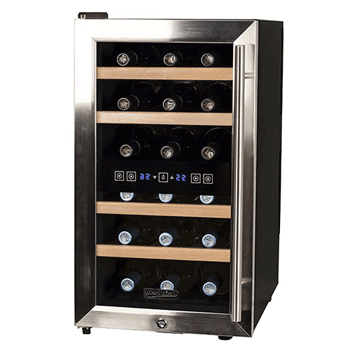 One such feature is the automatic, default temperature setting of 55 degrees Fahrenheit, the ultimate average temperature to store both red and white wines. This auto-default 55-degree setting would naturally be used if you only want to store your wines and protect them from spoilage, however, otherwise the cooler’s wide temperature range of 46 to 66 degrees Fahrenheit is ideal to chill either your reds or whites at their optimal temperatures for decanting. 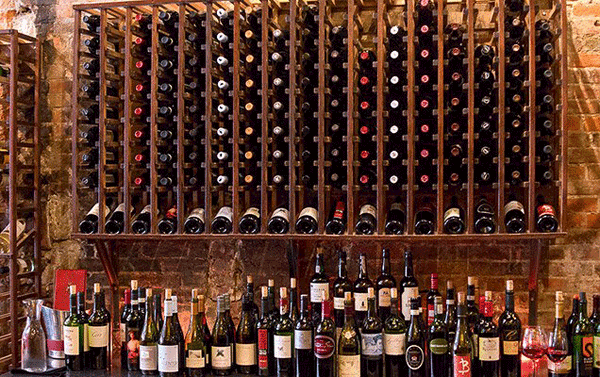 Chilling wines at temperatures ready for serving is probably what you’d typically use a six-bottle cooler for. The cooler’s internal temperature can be easily tweaked via the touch-screen up/down controls, with a convenient on/off switch for the internal light. This cooler’s internal light actually works to display the bottles and illuminate the labels, something which is otherwise just for visual appeal in many other wine coolers. Although this is indeed a countertop cooler (it is NOT intended for built-in or under-counter use), you should ensure proper electrical grounding, otherwise, you might get some unexpected electrocutions, however, small and slightly uncomfortable they may be. For a thermoelectric cooler, this unit reaches the user-set cooling temperature quite quickly, even when it has been moved around (which you’d probably do quite a lot since it is a very portable cooler). It does have a bit of a dependency on the ambient room temperature, however, as is also expected of a small thermoelectric cooler, so strategic placement should be exercised. Although it operates without the formation of frost, condensation does form, but this is provisioned for with an integrated water collection container right at the bottom of the cooling compartment. The WineCoolerLab team of wine lovers completed this Wine Enthusiast 6 Bottle Wine Cooler review taking into account its design, build, size and weight. Our biggest take-away from testing this cooler was that it fitted well in just about every suitable place you can think of to place it. Because of its sheer attractiveness to the eye, it is best brought out to an open entertainment area when some of your fellow wine-loving guests are over, but you can also place it in a setting such as your garage or den if all you want is to store your wines at their optimal storage temperatures. If you’re particularly limited of space, you’ll find this to be a very versatile countertop cooler that is also great to give as a wine-lover’s ultimate gift. Wine Cooler Lab Copyright © 2019. © 2015-2016 Wine Cooler Lab. All Rights Reserved. winecoolerlab.com is a participant in the Amazon Services LLC Associates Program, an affiliate advertising program designed to provide a means for sites to earn advertising fees by advertising and linking to amazon.com.